What on earth is that?! Driving a DRK – HubNut – celebrating the average! I get to drive a lot of cars, but this one was a true surprise. Especially as it is Renault-powered and I was at a Citroen event. What is it? 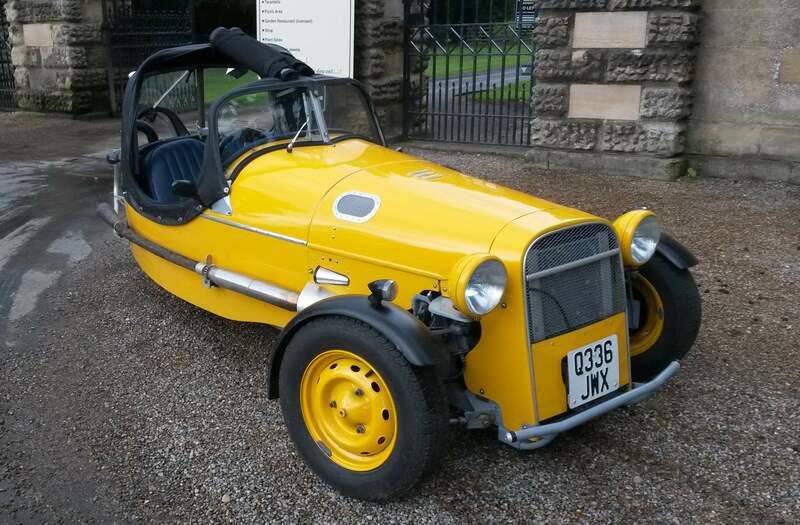 It’s a DRK – a three-wheel component car which uses a Renault 4 (or in this case 6) drivetrain and front suspension. 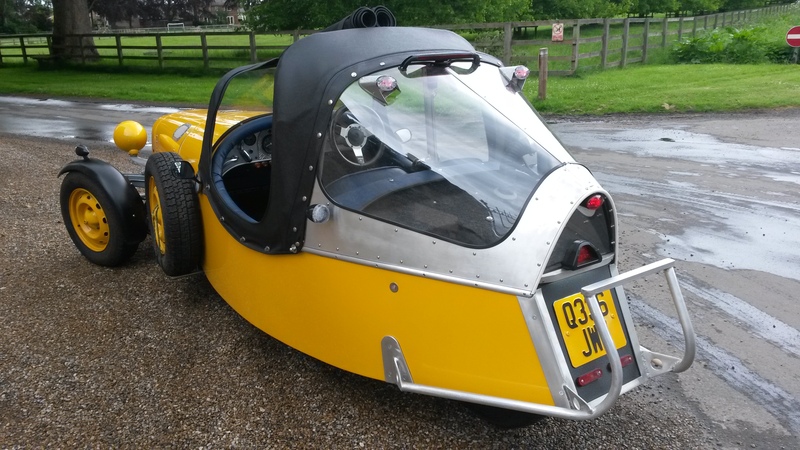 That means that it looks (at a very quick glance) a bit like a Morgan 3-wheeler, but is in fact front-wheel drive. This one belongs to a nice chap called Dan Fletcher, who is well-known for liking his cars a bit different. And colourful. It must be said, despite its tiny dimensions, this is not a car you’ll miss in a hurry. This is a DRK, and it’s lots of fun! DRK built cars in Cheshire, but not very many of them. 59 were produced between 1986 and 1998. Buyers got a very nicely finished kit car, but had to source their own mechanicals. Hopelessly rotten Renaults proved the perfect donors. Clambering aboard is the first challenge. There’s a hot exhaust pipe to contend with and you have to slide one leg in, drop your backside onto the seat, then shuffle across so you can pull your other leg in. Once behind the wheel, the driving position is low and fairly comfortable – I found the throttle pedal was a bit too close for perfect points to be awarded. Note upside-down Renault 6 gearlever. Very nicely finished inside. The gear lever droops out of the dashboard like a Citroen Traction Avant, simply being the standard Renault 6 lever, but turned upside down. That means that the H pattern is reversed – first is forward and twisted towards the steering column. 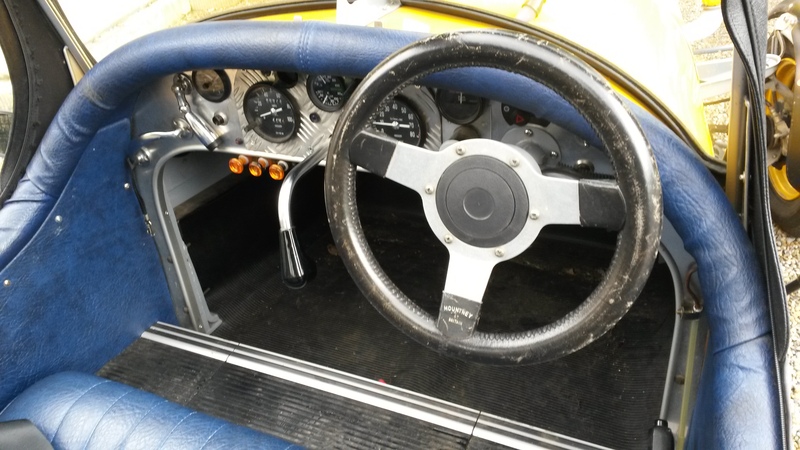 The handbrake is to the right, with a Dyane indicator switch squeezed between the wheel and the edge of the dashboard. There are other switches. I never did find out what they did. To drive, there’s very little clue that there is only one wheel at the rear. It’s only when you hit potholes that you expected to straddle that you get a clue. The steering is deliciously direct with tons of feel, and you can watch the mudguards bob around with the wheels. You can even watch the driveshafts rotate. You certainly feel very exposed, even with the unusual rear canopy. The engine, 1108cc in this case, pulls very strongly from low revs, but has a wonderful exhaust note as you keep your foot down. It isn’t ludicrously quick, but it is satisfyingly brisk. It doesn’t leave you really craving anymore, because being so exposed means you really do feel the rush of the breeze as you hurtle along. 60mph feels much faster than it does in say a Jaguar XJ6. Canopy not standard fitment. Eye-catching! Needs a rear-gunner. Turning into bends at speed, it feels remarkably stable. Having the engine so far back (behind the gearbox) must help here. There’s not too much weight slung out front and what weight there is sits very close to the front axle line. The ride is perhaps a little bouncy, though I was testing the car over particularly undulating roads. The front suspension retains the torsion bars of the 6, which are probably used to a little more weight. The rear wheel uses a DRK radius arm with a telescopic damper/coil unit. It has to be said though, it all feels very solid. That’s because these cars were very well built when new. You really did get a complete car bar the engine and gearbox. A steel chassis is mated with beautiful, aluminium panels, so it certainly isn’t a plastic-bodied lash-up. I reached the end of my drive feeling like I’d want to spend a lot more time with this car. It’s about as practical as a paper cagoule, but if it’s fun your after, here’s a relatively unknown vehicle that can really deliver. Thanks for this Ian – very glad you enjoyed the drive in the DRK. After 28 years ownership I still love it, but I’m finding it increasingly difficult to get in and out of the cockpit . . . I can’t remember if I mentioned that this car (DRK No.2) was fitted many years ago with an MGB anti-roll bar (and specially made drop links). This makes it handle much better than the standard R4/6 set-up with its weedy a/r bar and fairly useless rubber links. Also – I wouldn’t like anyone to get the impression that the weird rear end is standard DRK. Most owners are fairly traditional and some might (soon) be horrified by my modifications (which were only done last year). My son Tom and I are off to SW Scotland (staying in Gatehouse of Fleet) for a few days in early July, along with 5 more DRKs. I’ll try to send you some photos of the trip. When you have an idle hour or two (? ), have a look through the “Old Cars” section of the ORB web site – you’ll find lots of interesting pictures of old Citroëns (and info about their restoration). Thanks Dan. Sorry for the delay in responding due to too many weekends away from the internet!